Last week I took a little break from work and this blog to paint a bit. Namely to repaint our home. With my husband we thought we’d tackle it as a bit of a joint DIY project. It started out like that, but with all the unexpected little things along the way it took us more time and effort than previously thought. So much so, that my plans to take pictures before and after, make cute Instagram-worthy compositions, or just document our paint covered faces ended up being just that: plans. But one thing I did have time for while whitewashing the walls, to plan (obsess if you will) on the gift I would like to give my little nephew for his first birthday. One of the things my nephew Henrik adores is stories. He loves it when we read to him. He is absorbed in the tale, the pictures and the interaction we have with him during this specual time. For this reason I thought I’d make him a special picture book. One that not only has a simple little story which he will be able to relate to, but pictures to illustrate it with. And to make it even more interactive, I want to make little finger puppets to go with it. I thought and thought about it and ended up with the idea of animals. For one, because we have a dog which excites my nephew every time he sees him. On the other hand animals would give me the opportunity to later expand the list of characters, the story, but most importantly the little boy’s world and fantasies. So I thought I’d keep it simple this time and make the story around animals that can be found in or around the house: a dog, a cat and the mouse. I started doodling and very quickly came up with more animals than I originally intended. 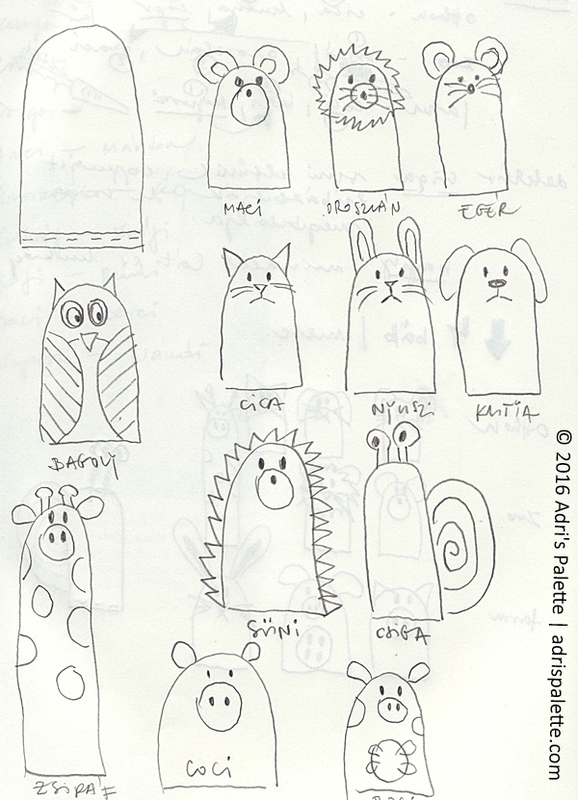 I was so pleased to see all these little faces suddenly appearing on the page. All the eyes on me and wanting to become alive. But there was one character that I really fell in love with, the snail. So I re-thought things and changed the concept just a bit. This little snail is going to become the detective of the story. He is going to be the central figure of the tale in which he will help the others find a lost precious item. The good thing is that I now have an outline for a story that I really like, and the characters that will be the central figures in it. One thing that worries me though is that besides the general idea there is no story yet. And no drawings to go with it (gulp). But first things first: I’ll make the little puppets because I am sure the colorful little creatures will give me the inspiration I need!